Are you suffering from injuries due to a truck or big rig accident? We can help. Our Santa Cruz personal injury law firm has the experience and success with truck and big rig accident cases that you need. Each year, thousands of innocent victims are killed or seriously injured by the negligence of big-rig truck drivers. Lack of sleep, unsafe driving practices, defective and oversized loads, defective and poorly maintained equipment, are just some of the causes of these otherwise avoidable accidents. When trucking accidents cause serious injury or death, it is guaranteed that the at-fault truck company will be well represented by experienced attorneys. 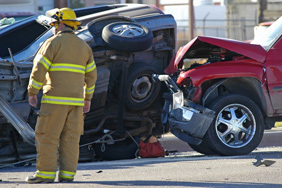 Accident victims and their families should insure that they have the same type of legal representation. The personal injury attorneys at Scruggs, Spini & Fulton are experienced at representing trucking accident victims and their family members. We have the resources to thoroughly investigate and to hire the most qualified experts in order to insure that our clients receive fair and just compensation. Trucking litigation involves claims against negligent truck drivers and the companies who hire them. Under the law, a driver of a large truck is considered to have an even higher standard of care than other drivers because of the injuries that their large trucks can cause. Collisions caused by a trucker’s negligence can lead to the most catastrophic injuries on the road. Examples of big-rig truck negligence generally fall into two categories: 1) driver error and 2) vehicle maintenance failure. The most common cause of driver error is fatigue, which can cause clouded judgment, drowsiness and falling asleep at the wheel. Driver error can also be due to inexperience, improper driver training and driving under the influence of alcohol or drugs. In addition, deregulation of the trucking industry has resulted in an increase in speed-limit violations among tractor-trailer drivers. Truck accident lawsuits tend to be far more complex than other vehicle accidents. Trucking companies and insurance adjusters realize the potential for major lawsuits when a truck accident is involved, so they immediately gather evidence and experts so they can begin to prepare their cases. Determining all the potential defendants can be extremely difficult and complex. For example, driver fatigue would likely be the driver’s fault whereas an accident caused by defective tires could be the tire manufacturer or distributor’s fault. If you or someone you know has been seriously injured in a truck accident, it is essential that you quickly retain an attorney who has experience in litigating truck accident cases. Delay in investigating a truck accident can result in lost evidence and the opportunity to establish the fault and responsibility for the accident.